Ada’s collection named Poseisus explores themes that are hinted at in the title of the collection, a portmanteau derived from Poseidon, the Greek god of the sea, and the fantastical Pegasus, the gleaming white winged horse. The collection references Greek Goddesses and the elegant structured beauty of the two native species of British seahorses; The Spiny Seahorse and The Short Snouted Seahorse which has inspirited her range of luxury women’s wear designed to be worn with effortless elegance. 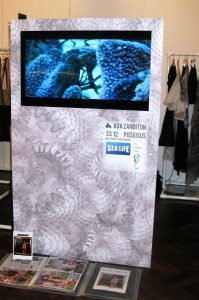 Accompanying the collection, the exhibit on Ada’s Stand featured a digital installation which was created in collaboration with The Seahorse Trust.. The installation showcased the key inspiration for the collection by showing the colourful delicate beauty of the seahorse via a virtual digital fish-tank installation where visitors were be able to get a close-up intimate glimpse of seahorses in their natural environment. The film footage on display was kindly provided by SEALIFE to promote seahorse conservation in a way that has never been done before, and many thanks goes to Ellie Cowley, Christian Cutler and Mark Oakley at SEALIFE. Visitors were invited to go to the stand and view the new collection, which this season thematically expresses the interconnected global fragility of island coastal environments in linking British coastal habitats with the strong resilience, primitive energy and fierce spirit of Haitian Island life. Ada is passionate about the natural world and we would like to thank her so much for supporting The Seahorse Trust and many thanks go to our partners at SEALIFE for funding the digital installation on the stand. Watch out for Ada’s sponsored swim coming up in December where she hopes to raise funds for the trust’s ongoing conservation and research work. Ada is gathering an enthusiastic team of volunteers to ‘Swim for Seahorses’. Keep checking this site or Ada’s site for details of how you can sponsor the swimmers.